Wild Hogs is a 2007 comedy starring John Travolta, Tim Allen, Martin Lawrence and William H. Macy as middle-aged friends living in Cincinnati, Ohio who own Harleys and like to go for urban / suburban rides and hang out at the “biker” bar in the city, called “Byker’s Island”. Woody, played by John Travolta, is a (formerly) rich lawyer whose swimsuit model wife recently left him, causing him to have a breakdown, losing his job and his house too. One afternoon after a ride, he questions his friends about what they are doing with their lives and suggests a real ride – a road trip to the Pacific. The other Wild Hogs are Doug, a dentist played by Tim Allen, has a loving wife but can’t connect with his young son and needs to watch his stress and cholesterol levels; Bobby, played by Martin Lawrence, is a henpecked plumber with an overbearing wife and out of control daughters; and Dudley, played by William H. Macy, is a shy, nerdy computer programmer who is afraid to speak to women. All agree to take the road trip and to find some real fun and adventure and reclaim the wild guys they used to be in college. Here is a video of the opening scene where the characters get together for a suburban ride. Here is a video that Pat took from the back window of our SUV as I drove up and down Laguna Boulevard SW. This scene during their ride takes them through the old Rail Yards in Albuquerque. They are not accessible, so we took a photo from the street. During their ride, the Wild Hogs take a quick break so Dudley can check on his bike after an earlier fall. This scene was filmed at a parking lot at the corner of Central Avenue & 2nd Avenue NW. Unfortunately, Dudley loses control of his bike in the parking lot. After falling off, the bike hits the curb and flips into the air, striking a light pole. This location served as the Wild Hogs’ hangout “Byker’s Island” where they go to relax and have a beer after their ride. Woody, having lost everything in his life (but doesn’t reveal that to this friends at this time), questions their upscale middle-aged, suburban biker personas – stating that instead of Wild Hogs, they’re more like wild lambs. They lament that they have lost their wild side that they had in college, and wanting to reclaim their sense of adventure, decide to take a road trip to the Pacific with their Harleys. The Wild Hogs are getting ready to start their journey to the Pacific from US 50 in Cincinnati. The scene was shot at Tijeras Avenue NE in Albuquerque, New Mexico. The landscaping in the background of the movie was added for the movie. The actual area features xeriscaping. The Wild Hogs are getting ready to start their journey to the Pacific from Cincinnati. Dudley shows off his “tat” he got at the Meadow Hills Galleria for the trip – now he’s a biker! The others laugh at his Apple logo tattoo. The location along Tijeras actually does not have alot of grass or plants. The fountain (minus water) is visible in the back, as well as the building to the left. Doug is excited that Dudley got him set up with a GPS in his phone for the trip, to which Woody replies they don’t need a GPS to discover America and throws Doug’s cell phone into a nearby sewer. And the sewer was nearby too! Another view of their meeting spot, which has the added effect of being in Cincinnati by the addition of highway signs showing US 50 West. In reality, US 50 is in Colorado, much farther to the north of this location in Albuquerque! After Doug, Woody, and Bobby dispose of their cell phones, Dudley throws his into the windshield of an oncoming truck, causing them to quickly jump on their bikes and take off. This is the same location as above on Tijeras Avenue NE, only the opposite side of the underpass. As the Wild Hogs travel west, the road scenes, whether they were supposed to be in Illinois or Missouri the first night, were all filmed in New Mexico (and it shows!!). 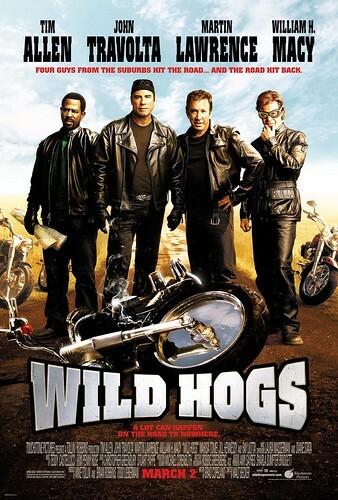 The Wild Hogs are excited to stop at a “real” biker bar in New Mexico, which is home to the biker gang, the Del Fuegos, led by Jack Blade, played by Ray Liotta. 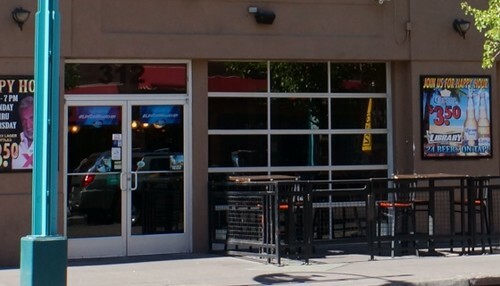 The Del Fuegos are infuriated by the intrusion of suburban biker “posers” at their bar, telling them they aren’t real bikers. They steal Dudley’s Sportster, leaving him with a sidecar attached to Woody’s motorcycle. Woody, ashamed at the incident goes back to the bar to get Dudley’s bike. He cuts the fuel lines to the Del Fuegos’ motorcycles, causing the bar to explode when Jack’s cigarette falls into the gas on the ground. With the Del Fuegos’ bikes damaged, the Wild Hogs are able to get away…for now. However, Woody doesn’t tell the other Wild Hogs what actually happened, instead telling his friends he threatened to sue the Del Fuegos if they didn’t return Dudley’s motorcycle. In the scene below, the Wild Hogs have run out of gas due to Woody’s panic about having blown up the Del Fuegos’ bar, and insist they get gas at the next stop. To bad, they don’t see the gas station sign that the next station is 200 miles away. Tired, hot and thirsty, they arrive in Madrid, New Mexico. Here is the same location in a later scene, when two of the Del Fuegos arrive in Madrid. 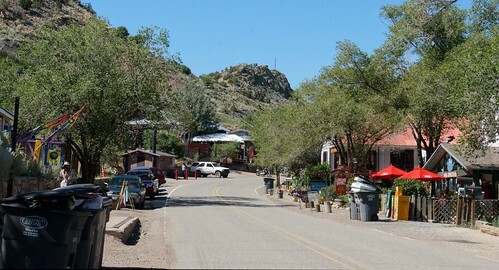 The majority of the remaining scenes were filmed in Madrid, New Mexico, which is located along NM 14 (The Turquoise Trail), a scenic ride from Santa Fe south to I-40/US 66. A small portion of NM 14 in Santa Fe (north of Madrid) is also a part of the Santa Fe loop, a pre-1937 alignment of Route 66. 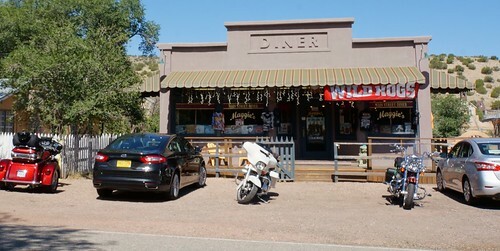 The Wild Hogs arrive at the fictional Maggie’s Diner in Madrid, New Mexico. They’re extremely thirsty and their uncharacteristically raucous behavior in begging for water or something else to drink, causes the townspeople to mistake them for the Del Fuegos, who periodically arrive in Madrid and demand food and drinks at no charge and frighten the locals. Maggie’s Diner was a set built on location in Madrid, and was left to the town by the film company. It was brought up to building codes, and now is used as a gift/souvenir shop selling – what else – biker and Wild Hogs merchandise! I picked up a couple of shirts – Del Fuegos and Wild Hogs. The next photos show what is depicted as the hotel the Wild Hogs stay in Madrid, as the gas station is closed until the next day. Upon hearing that the Del Fuegos periodically come to Madrid, Woody is extremely panicky to leave town, fearing that the Del Fuegos will soon arrive, find them, and take revenge for blowing up their bar. The Old Boarding House Mercantile is a very nice general store in an old house – it’s pretty unique as it uses the original house rooms for different categories of merchandise. They have a variety of items for sale, general merchandise, groceries, snacks, drinks, coffee, etc. Shy and afraid of women, Dudley finds romance with Maggie, played by Marisa Tomei. Maggie owns the local Diner which bears her name. After an enjoyable night together at the town’s Chile Fest, the next morning Dudley and Maggie would like to have breakfast with the others, but Woody is anxious to leave before the Del Fuegos arrive. But it’s too late – here come the Del Fuegos! The Del Fuegos have arrived in Madrid and are ready for retaliation – or compensation – for the loss of their bar. The other Wild Hogs are confused about this, since Woody told him they gave him back the bike after the threatened to sue them. With no other choice, Woody confesses to his friends about cutting the fuel lines to the motorcycles, resulting in their bar being blown up. The Wild Hogs now realize the Del Fuegos want to kill them, so they hide out at Maggie’s house, hoping they’ll give up and leave…but instead the Del Fuegos invade the diner, threatening to burn it down. Here, Dudley confronts the Del Fuegos which they remark is brave but stupid – they string him up over the main road and will beat him up if the Wild Hogs don’t pay them for their bar. Here is the exterior of Maggie’s Diner building in Madrid. Finally, the Wild Hogs confront the Del Fuegos. Led by Woody (who has lost everything in his life and has nothing to lose), their attempt to rescue Dudley fails and they fight the Del Fuegos. Despite repeatedly being beaten to the ground, the Wild Hogs stand up each time to the Del Fuegos. Finally, the townspeople of Madrid realize that if four guys can stand up to 50 bikers, 500 of them can too. As the townpeople and Wild Hogs surround the Del Fuegos, who still won’t back down, their former leader and owner of the bar, Damien Blade, played by Peter Fonda, arrives in town and tells Jack and the other Del Fuegos to stop and let it go. He tells them they have lost touch with what being a biker is all about – riding and the highway…and that they – not the Wild Hogs – are the posers. He thanks the Wild Hogs for burning down the bar, explaining that he insured it for twice its value and he did them a favor. The Del Fuegos leave and Jack says goodbye to Damien, calling him Pop; Damien shakes his head, saying Jack’s just like his mother. Damien tells the Wild Hogs to ride hard or go home, and gives them one last piece of advice….lose the watches! This entry was posted by Jennifer on July 20, 2014 at 7:07 pm, and is filed under Filming Locations, Road Trips. Follow any responses to this post through RSS 2.0.You can leave a response or trackback from your own site. Hey guys this was great. As a tradition we watch the Wild Hogs movie before our road trip every year.Our road trip this year is taking us to Texas and New Mexico the last two continintal states we’ve not been in on our bike. Looking forward to this nostalgic trip. Thanks for the trip down memory lane. Glad you enjoyed the post! We certainly enjoyed making it…we love the movie as well, and this one was a lot of fun! Have a great trip! !